Working a horrible backlog of posts, due to recent events I was unable to post this at the correct time. When we got to the A&E in Crumlin, we were sent to triage straight away. We were not waiting long then to see a series of nurses and doctors who were examining Daniel from head to toe, checking his breathing, his oxygen levels etc… There is an awful lot of repeated activities and the same discussions with every new face that comes into the room to see Daniel, but it’s all for good measure and despite it aggravating my already low patience levels, I am thankful for just how thorough the staff are in Crumlin’s children hospital. After seeing the doctor we were advised that Daniel was suffering from Bronchiolitis which is an inflammation of the bronchioles, the smallest air passages of the lungs. There is no real treatment plan for this other than to try and maintain the child’s intake of fluids. As it’s a viral infection rather than a bacterial infection doctors try to avoid giving antibiotics. The doctor in charge of admissions was quick to suggest that he should be admitted for the night so that they could administer a glucose drip and where needed give him oxygen or a nebuliser to help his breathing. 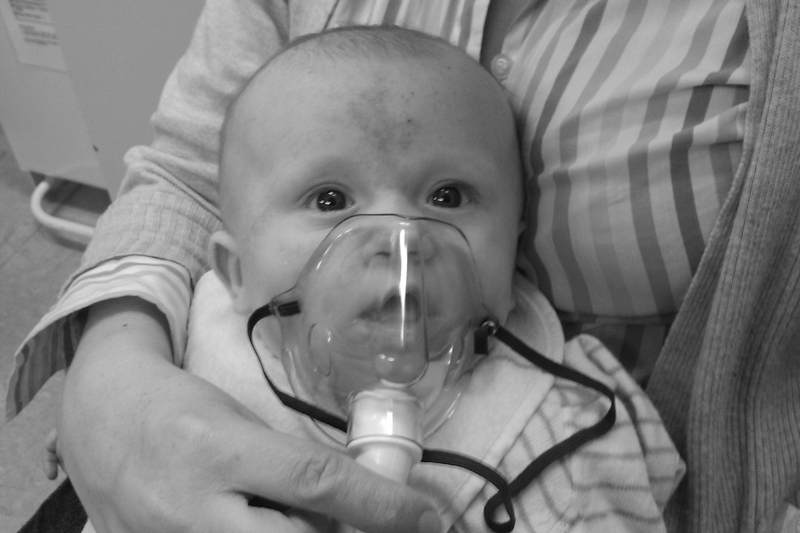 After signing consent forms and admittance paperwork Daniel was placed on a nebuliser to help with his breathing and to help clear his chest. 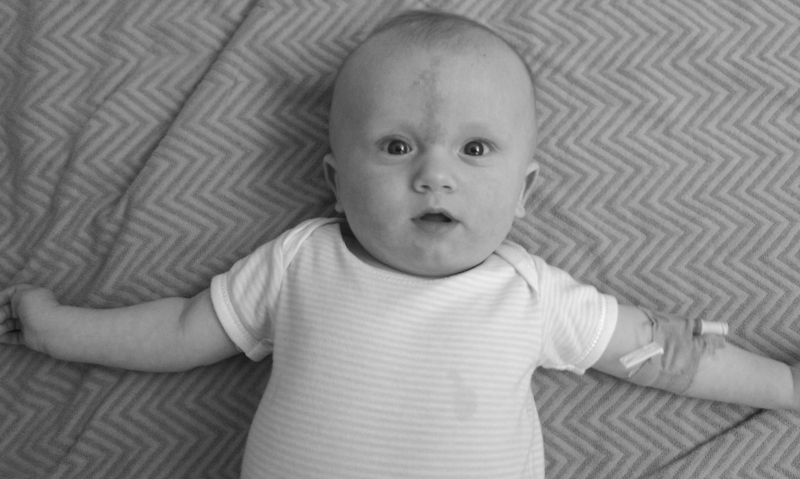 Daniel then had his bloods taken and was placed on an iv glucose drip. Within the hour he was already looking more like his usual self. Then came the news that there were no beds available in the hospital for Daniel, so we were given the choice of staying in Crumlin and sleeping in the corridor of the A&E for the night or a private room in the Children’s ward of Tallaght hospital. It should be noted that regardless of which children’s hospital you go to, it doesn’t make any difference if you have a government issued Medical Card or Private Health Care insurance, there are no private children’s hospitals in Ireland and all children are treated equally when it comes to receiving medical attention. Our health insurance cover does however entitle us to a private room in public hospitals where the facility and rooms are available, also on this occasion it was a recommendation of the doctor that Daniel be isolated from other sick children that might be on a ward. We had never been to Tallaght but like many others we have heard plenty of nightmare stories about the usual things like overcrowding , people sleeping on beds in corridors etc… naturally enough we were a bit cautious about saying yes to a transfer, but the option of spending the night in the corridor of children’s A&E didn’t sound very appealing either. We decided to go for the transfer, as Daniel’s stats were now stable and he was already on a drip, there was no rush for the ambulance to arrive so that he could be transferred to Tallaght. I was keen to drive them myself but the nurse said this was no longer possible because he had been given a cannula for the iv. So instead I followed the ambulance out to Tallaght hospital. The transfer to Tallaght only took 15 minutes, initial impressions on arrival at Tallaght were that the place was miserable looking and smelly (cigarette smoke). There were men and women of various ages, out in the cold in their pajamas, some of them younger than me and rigged up to oxygen tanks smoking their brains out. All this, right outside the main entrance to the hospital. (I’m so very glad I kicked my 22yr habit) Just as we entered the main part of the building there were security guards wrestling a couple of guys to the ground who were kicking and punching each other while a teenage girl screamed at them and the security guards. Not a great first impression. For some reason I had always thought of Tallaght as being just another children’s hospital, when in reality it’s a major public hospital with a couple of busy A&E departments. I did a bit of research about the hospital and it’s catchment area. Tallaght now services the highest concentration of families and young children in Ireland. The children’s ward is up on the second floor and is split into three wards by age group, Daniel was admitted to the Maple ward which is for children under the age of one. The ward and room were clean and well presented and the staff were all lovely. Lot’s more tests, bloods and a set of chest x-ray’s later Daniel was ready to try and settle down for the rest of the night. He was given lots of attention through the night by the nurses and following a check up with the doctor in the morning he was discharged. We were advised to keep an eye on him and watch out for signs that the virus may turn bacterial, if this was the case he would have to have a course of antibiotics to help clear it up. There is a great feeling of relief when the doctor says your child can come home. Hope you’re all back on track very soon Dan. You’ll look back on these posts with great fondness in the future! Chin up!! Clear coverage, cool pics. Hope you’re all on the way upward.